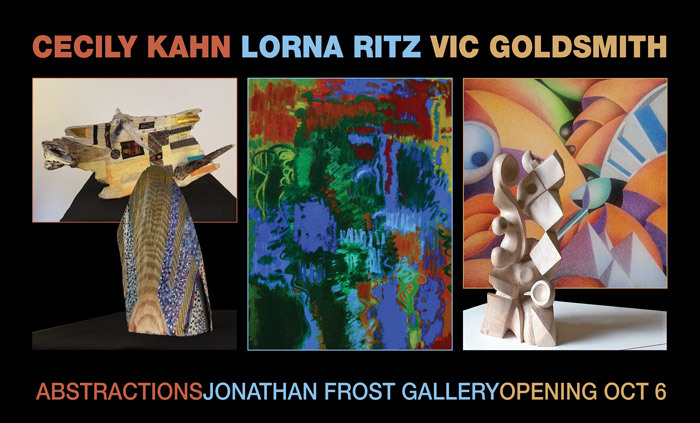 On Friday, October 6, from 5:30 to 8:00, the Jonathan Frost Gallery in Rockland will host the opening reception for a show called “Abstractions,” featuring the work of Victor Goldsmith, Cecily Kahn, and Lorna Ritz. Steve Lindsay will play jazz piano. At 1:00 p.m. on Saturday, October 7, the three artists will talk and answer questions about their work. The public is cordially invited to attend both events. At 1:00 p.m. on Saturday, October 7, the three artists will talk and answer questions about their work. The public is cordially invited to attend both events. Victor Goldsmith grew up in Potsdam, New York, where his father taught sculpture and painting at SUNY Potsdam. The younger Goldsmith spent many hours in his father’s studio/classroom, working on his own creations. He gained a love and understanding of music from his father, who was also a classical pianist. Victor Goldsmith grew up in Potsdam, New York, where his father taught sculpture and painting at SUNY Potsdam. The younger Goldsmith spent many hours in his father’s studio/classroom, working on his own creations. He gained a love and understanding of music from his father, who was also a classical pianist. Cecily Kahn grew up in New York City with not one, but two, parents who were artists. As an adult she remained in the city but began many years ago spending summers in Friendship, Maine. Now she lives here year round but continues to be represented by galleries in New York and Atlanta. She is a member of the American Abstract Artists group and is chair of the Advisory Board of The Painting Center. Cecily Kahn grew up in New York City with not one, but two, parents who were artists. As an adult she remained in the city but began many years ago spending summers in Friendship, Maine. 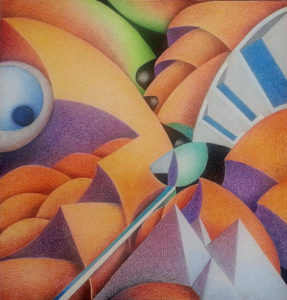 Now she lives here year round but continues to be represented by galleries in New York and Atlanta. 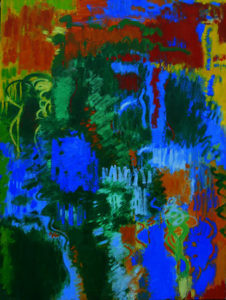 She is a member of the American Abstract Artists group and is chair of the Advisory Board of The Painting Center. The buildings and streets of New York have always influenced Kahn’s work; she began with cityscapes and maps. “Eventually,” she writes, “these map paintings shed their representational base and became more internal, psychological maps.” At the Jonathan Frost Gallery she is showing small painted wood pieces; some are driftwood, some the sawn-off ends of wharf pilings. The buildings and streets of New York have always influenced Kahn’s work; she began with cityscapes and maps. 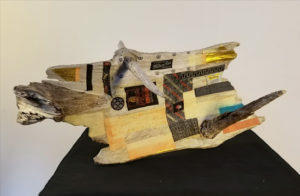 “Eventually,” she writes, “these map paintings shed their representational base and became more internal, psychological maps.” At the Jonathan Frost Gallery she is showing small painted wood pieces; some are driftwood, some the sawn-off ends of wharf pilings. Lorna Ritz received a BFA from Pratt and an MFA from Cranbrook. She has taught at RISD, Brown University, Dartmouth, the University of Minnesota, and the New York Studio School, and has shown extensively at galleries, museums, and embassies. In her paintings she is developing the tradition coming out of cubism and Hans Hofmann’s plastic space. Lorna Ritz received a BFA from Pratt and an MFA from Cranbrook. She has taught at RISD, Brown University, Dartmouth, the University of Minnesota, and the New York Studio School, and has shown extensively at galleries, museums, and embassies. In her paintings she is developing the tradition coming out of cubism and Hans Hofmann’s plastic space. Like Goldsmith, she draws musical analogies in describing her work, and some of her titles identify auditory subjects: “Voice of Love,” “Painting to Birdsongs and the Wind.” “How colors relate is everything,” she says; “the color finds the light, creates the shape.” She aims to let her paintings “sing” through the light that emanates from seasonal color combinations; she searches for compositions through rhythms, harmonies, synchronizations and counterpoints. We’re at the corner of Main Street and Park Drive in Rockland, next to the Park Street Grille.